The system soon after the introduction of the new T-Third Light Rail Line (on 7 Apr. 2007). C Financial District - California St. - Van Ness Av. Cable car lines: 8 km. 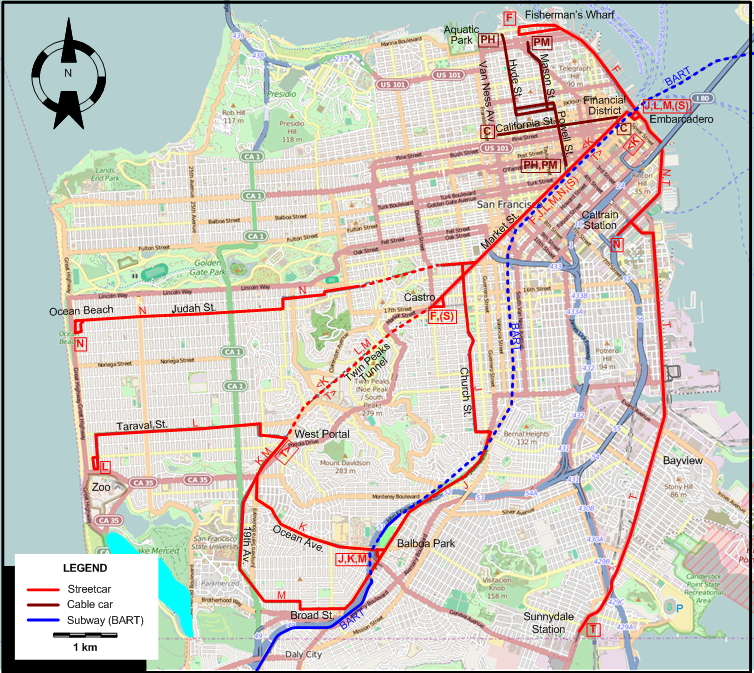 BART (Subway) lines: 167 km. San Francisco streetcars: (horse-drawn) 4 July 1860 - 1882; (electric) 1892 - today. San Francisco cable-cars: 1 Sept. 1873 - today. BART (Subway): 11 Sept. 1972 - today. Key System (Interurbans): 26 Oct. 1903 - (Into San Francisco only from 15 Jan. 1939, following the opening of the Bay Street Bridge on 12 Nov. 1936) - 20 Apr. 1958. Oakland cable-cars: 1886 - ? The San Francisco Railway Museum displays many relics of the streetcar and cable car history of the city. The Market Street Railway operates many historic streetcars over actual line F of the San Francisco streetcar system (Muni). The cable car system has its own museum at the Cable Car Museum at Washington and Mason. The Western Railway Museum in Rio Vista Junction, Suisun City, about 40 miles (65 km.) 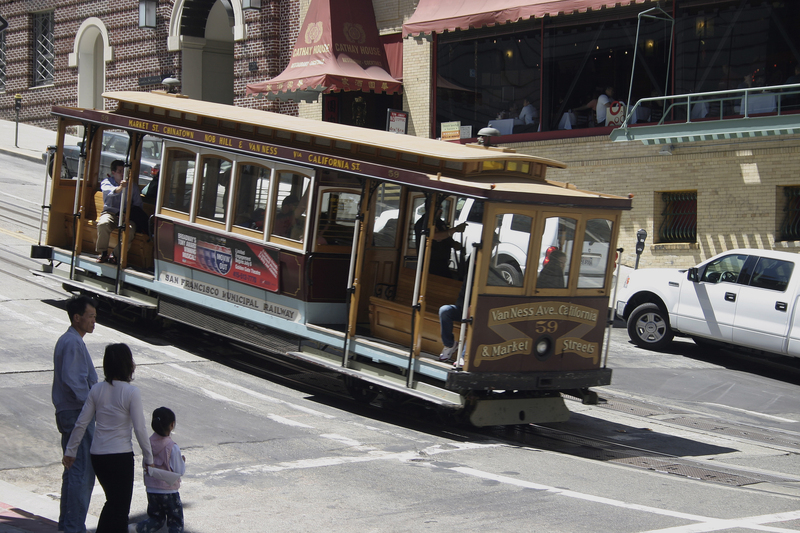 north-east of San Francisco, has both restored heritage streetcars and interurbans in its collection, running them on museum tracks for visitors. "Around San Francisco Bay", The Bulletin - National Railway Historical Society, 1970 (35: 2), p.10-52. "Balancing act on Fillmore", Inside Track, 2014 (No.1), p.7-10. Currington, B. 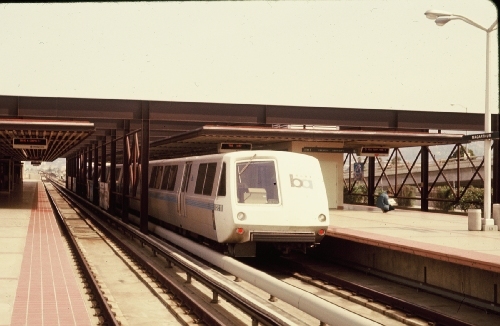 "San Francisco Municipal Railway modernisation (Part 1)", Modern Tramway & Light Rail Transit, Oct. 1984 (47: 565), p.339-347. Currington, B. "San Francisco Municipal Railway modernisation (Part 3: Completion)", Modern Tramway & Light Rail Transit, Jan. 1985 (48: 568), p.16-24. Demoro, H.W. "A documented account of the conversion from rail service to motor bus bv the Key System", National Railway Bulletin, 1979 (44: 6), p.4 - 44. Dodge, J.W. et al. "Key System interurban lines", The Western Railroader, date ?, p.3-14. From shore to shore: The Key Route [San Francisco (? )]: Peralta Associates, 1948. "East Bay transit: Oakland-Berkeley streetcars, 1937-1948", The Western Railroader, May 1973 (36: issue 397), p.2-8. Laflin, A.H. (Jr) "A chronology of changes in San Francisco Street RY routes since 1944", Timepoints Special Reference Supplement No. 7, June 1953. Laubscher, R. On track - A field guide to San Francisco's historic streetcars & cable cars. Berkeley: Heyday, 2014. "Los Angeles and San Francisco", The Modern Tramway, Nov. 1949 (12: 143), p.221-224. Market Street Railway Co. [Timetable and route map]. San Francisco, May 1941. "Municipal Railway of San Francisco", The Western Railroader, Aug. 1961 (24: 8), p.2-12. Rice, W. "Andrew Smith Hallidie's cable legacy", Tramways & Urban Transit, Apr. 1999 (67: 736), p.136-139. Rice, W. "San Francisco rail is moving forward", Tramways & Urban Transit, Sept. 1998 (61: 729), p.336-339. Rice, W. & Echeverria, E. The Key System: San Francisco and the Eastshore Empire. Charleston (NC): Arcadia Publishing, 2007. "Richmond Shipyard Railway", The Western Railroader / The Western Railfan, Sept. 1981 (44: 491), p.1-8. 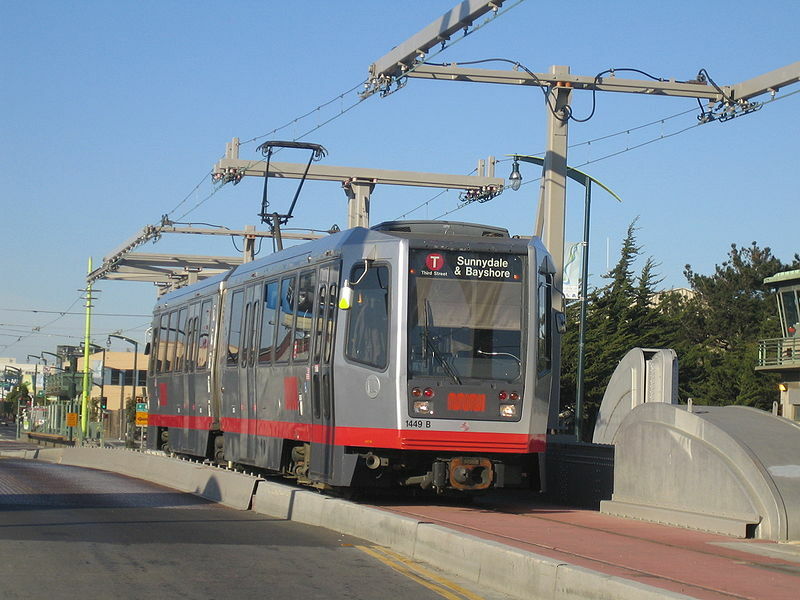 Russell, M. "San Francisco's decade of achievement", Tramways & Urban Transit, Apr. 2010 (73: 868), p.156-157. Russell, M. "Waterfront torpedoes", Tramways & Urban Transit, Feb. 2017 (80: 950), p.76-77. "San Francisco Municipal Railway, 1950-1964", The Western Railroader, Jan. 1965 (28: 1), p.2-16. "San Francisco Municipal Railway - Merger of 1944", The Western Railroader, 1963 (26: ? ), p.2-24. Sappers, V. Key System streetcars Berkeley: Signature Press, 2007. Townley, R.P. San Francisco transit milestones Manuscript, 2005. Vielbaum, W., Hoffman, P., Ute, G. & Townley, R. San Francisco's Market Street Railway. Charleston (NC): Arcadia Publishing, 2004. Vielbaum, W., Townley, R., Rice, W., Echeverria, E. & Holmgren, D. San Francisco's interurban to San Mateo. Charleston (NC): Arcadia Publishing, 2005. 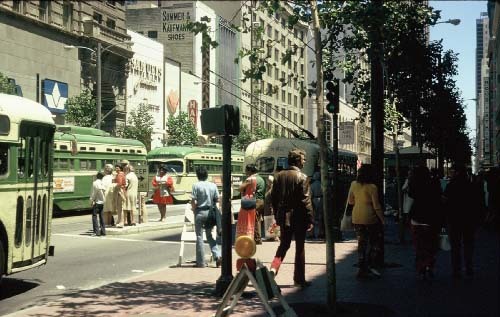 Special thanks to Bob Townley of Fairfield, CA for his kind suggestions for improving these pages on the history of the rail-based urban transit network of the San Francisco area.